With Valentines approaching why not throw a dinner/dessert party with your favorite peeps. Valentines isn’t just for the love birds I feel it’s a day to show love for the people who mean the most to us. 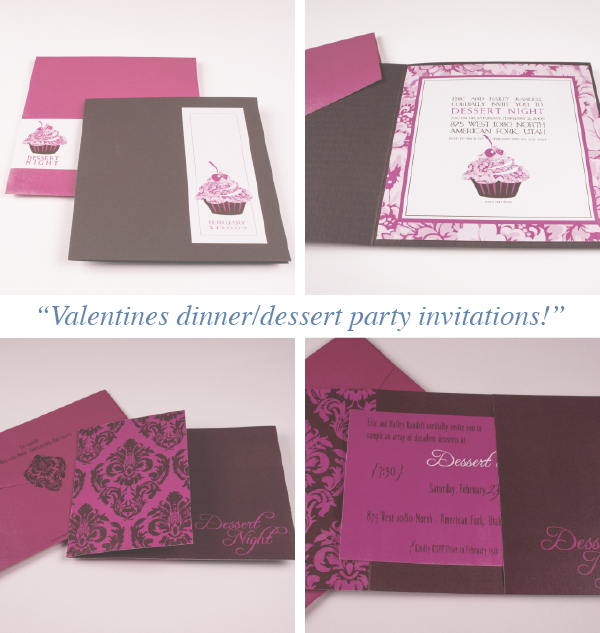 I love the invitations below the colors and sweetness gives the dinner/dessert invites the perfect tone for a delightful dinner. So show your love with a fun sit down dinner and a formal invitation announcing how you want to host Valentines this year. Plannng a party for your favorite peep! Summer is here and the weather is perfect for hosting a gathering with your closest friends. 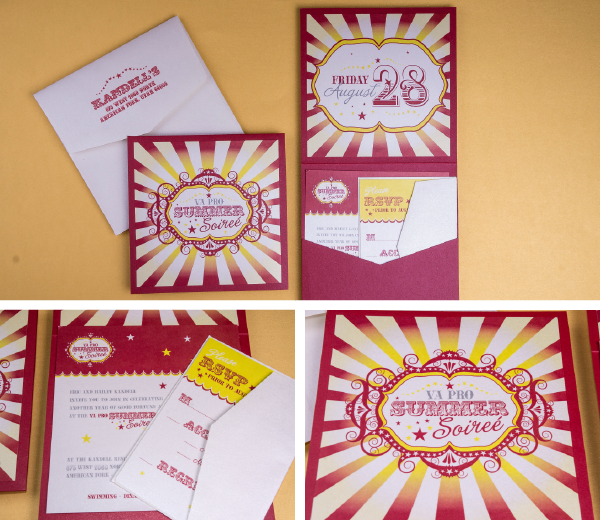 This week I thought I’d share some fun party invitations from our portfolio. 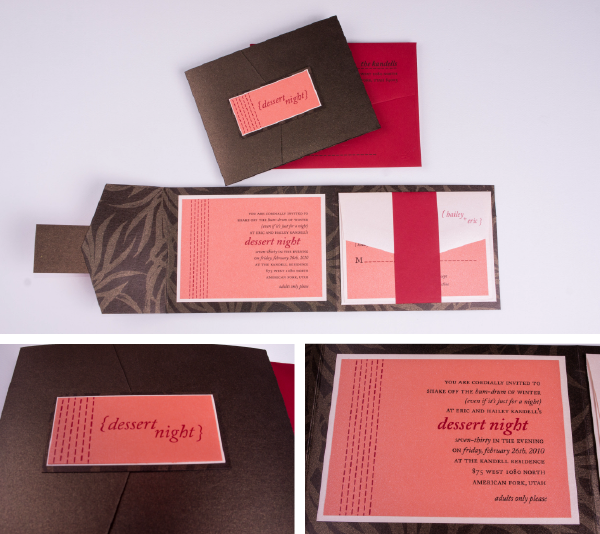 We get to let our creativity flow as we start working on ideas that match the client's theme and really make the party come to life through the invitation. First we have a Mexican Fiesta themed party. The neon pink and green two color/duplexed paper we used for the pocket was a great starting point for the bright colors of this invitation. 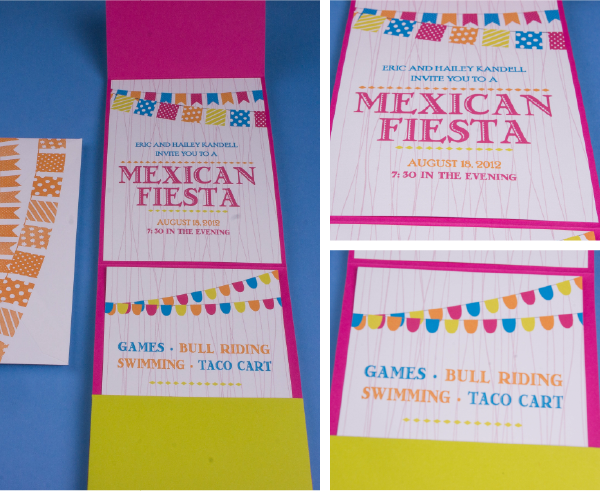 The details card that pulls out of the pocket reads “Games, Bull Riding, Swimming, Taco Cart” ... It's a lead in to the events in store so the guests know they don’t want to miss this party! Our next grouping is a company party for a Summer Soiree. This invitations bold color scheme and western-esque theme grabs the attention of its holder and intrigues one’s interest. Quite a bit of details needed to be conveyed in this invitation so a pocket style to hold an rsvp set and details card was just the right fit. In this next grouping we have two birthday invitations. The first one is a for a surprise 30th birthday. To make this invitation really go down in history we used semi embarrassing photos of the birthday boy. We hope he received the right amount of razzing from his friends! The next invitation is a simple piece printed on both sides. 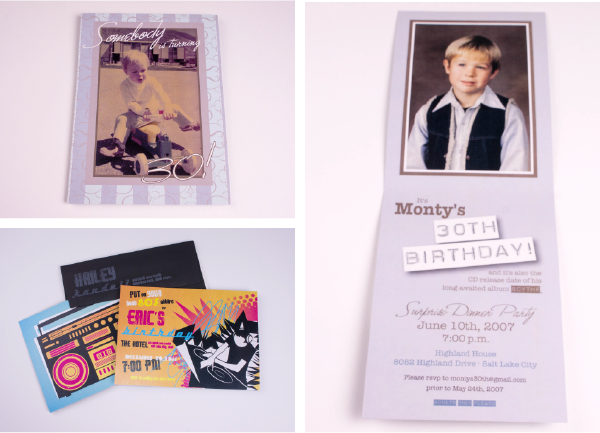 Retro graphics, colors and the printed black envelope clearly let the guests know to get their 80’s on and come party! I love this elaborate invitation for a theme of "Tuna Dinner" for a girls dinner party. The party theme was chosen because the date of the event fell on Chinese New Year. 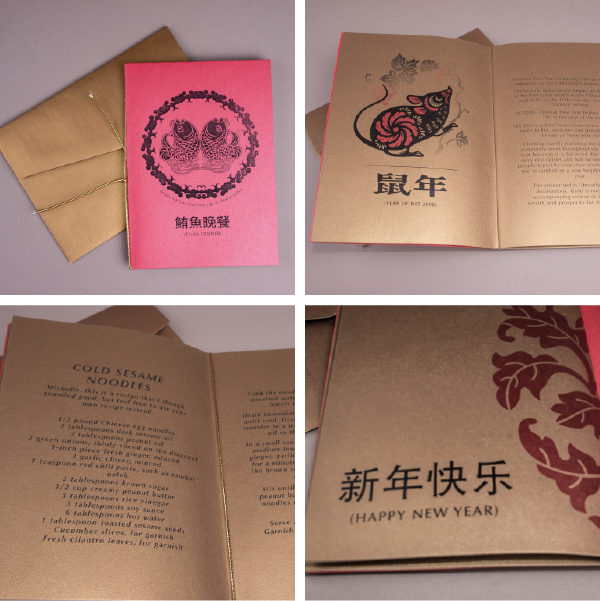 The detail that goes into this is well thought out from the booklet style that gives fun facts about Chinese culture and the sharing of cold sesame noodles recipe is a fun creative way to have guest over for a dinner party. The last one is an invitation to a Dessert Party. Who wouldn’t want to go to a dessert party? Its simplicity of information combined with beautifully designed details, layering and the printed pattern on the inside make this invitation a win in my book! Next time your thinking of planning a get-together with friends remember to pick a theme that best suites your ideal party and let your invitations set the tone for the events to come!